I had an epiphany of sorts last night while pulling shirts from the laundry pile. I was folding a quick load of laundry between stirring and chopping things for dinner. This is really the only way I’ve found to multitask—doing two chores at once—because neither activity requires much of my mind. Stir, fold, chop. Stir, fold, chop. 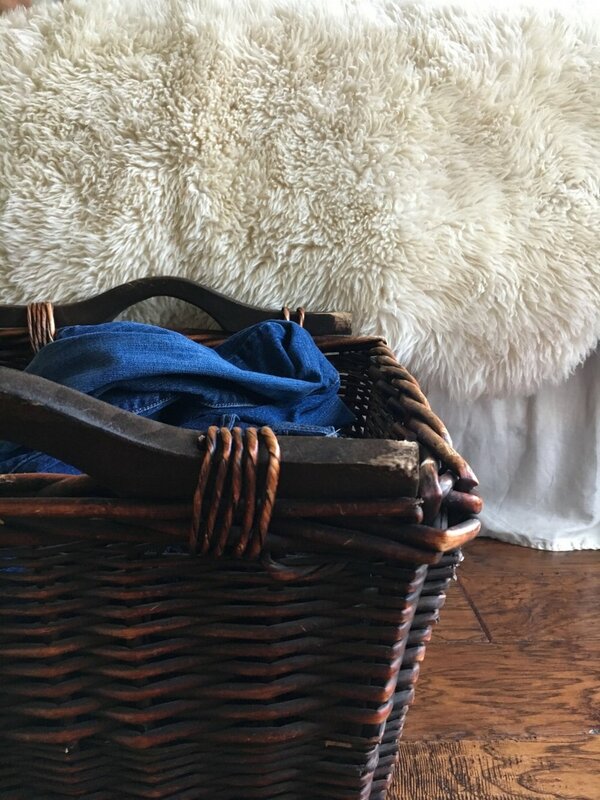 My modus operandi for laundry is to dump a clean load or two in the wicker basket at the foot of my bed and hopefully get it folded and put away by the end of the day. I love being able to fold it warm and wrinkle free, straight from the dryer, but most evenings there is either laundry on the bed, waiting to be put away, or laundry filling the basket. The epiphany was this: instead of laying our shirts out on the bed, then piling them over my arm to take them to the closet to be hung, why not just grab the empty hangers and deal with the shirts once? Hang them right out of the basket? And then I can just gather the hung shirts off my bed and put them away. It’s dumb for several reasons: laundry is not that big of a chore, this "epiphany" is not that exciting, and why had it taken me so long to wake up to this simple solution? It made me wonder how many other areas of my life are dumb like this. Where else am I doing things the hard way or the long way or the old way, when an easy fix is right under my nose? There is no reason why my laundry epiphany came when it did. I wasn’t being reflective about the chore, wasn’t considering ways to be more efficient. I was only thinking I’ve got to get this put away before bed time. Of all the time I do spend racking my brain for ways to create spare time, this one came to me uninitiated. I may not be saving large quantities of time, but minutes add up and it feels good to do things the smarter way. There are so many things in my daily routine that I’m just used to. I don’t really see the pictures on the wall anymore because I’m used to them. I don’t really hear the fridge running because I’m used to it. I don’t really notice the dumb things I’m doing because I’m used to them and that’s just the way I’ve always done it. The way I’ve always done things may not be the best way. My soul has habits that are deep grooves in my routine; some of them are bad, some of them are good. In Ephesians 4, Paul talks about putting off the old man and putting on the new, like changing a garment. He says to stop lying, and speak truth; stop stealing and start working so you can give; stop speaking rotten words and start using words that edify. Life has this vacuous quality to it and it is a law of nature that, just as space doesn’t like to be empty, neither do our souls. I tend to focus on the put-offs, on the negatives that need fixing and the quirks that hold me back. But for every sin and weight we are called to drop, there is something positive to focus our attention on. We don’t clean and clear and declutter our souls so they can be left empty—we do it to make room for better things. But our habits are hard to see sometimes, as close as we are to them. I’ve recently succumbed to wearing glasses most of the day because I just can’t see things under my nose—I gently put my arm out to people who come to talk privately with me, up close, because they will be a blur to me if they’re too near. Glasses help, but it takes some adjusting to learn to look through the top of the glasses to see at a distance, bottom of the glasses to see up close. We need to hold ourselves at arm’s length now and then and give us a good look. Gently. What is stuck in us that needs to be put off? What habits or ways of being are destructive, or just plain inefficient? Similarly, we need people who get up close, who love us enough to tell us the good but also the bad—who point out our blind spots without making assumptions about the hows and whys. People who ask good questions. People who say profound things without even knowing it. Spouses or children or friends. We can’t always manipulate or meditate or figure our way into a solution. We may work for years to stop a habit or put on a better discipline, and then one day, out of the blue and while dinner simmers on the stove, you realize a better way to do the laundry. Maybe your life changes in the tiniest ways like this.